There is something splendid about the return of the Oakland Ballet Company. In just over a year it has returned to its former excellence, with capable and talented dancers performing in productions that are often breathtaking in their production. It’s a testament not only to Ronn Guidi—his dedication and expertise as theatrical director—but also to Oakland that the area has the wherewithal and desire for large-scale theatrical dance performance. 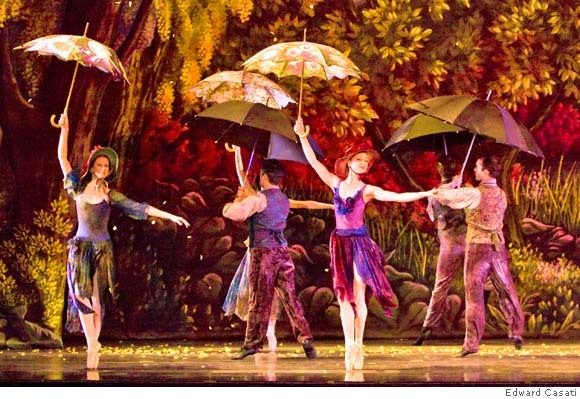 On Saturday the newly resurrected Oakland Ballet Company presented two performances of The Secret Garden, one of the last full-length ballets choreographed by Ron Guidi before he left the company six years ago. Based on the 1909 children’s novel by Frances Hodgson Burnett, the story tells of a young orphan girl, Mary, brought to live at an uncle’s manor, who finds the garden that belonged to his dead wife. Through her efforts and those of the servant’s brother, Dickon, Mary brings the garden back to life and in the process heals not only herself but her grieving uncle, Archibald Craven, and his ailing son, Colin. The story is lush with possibilities for stage. The Oakland Ballet sets by Ron Steger were lovely: redolent with late-19th-century sensibility, the manor gardens painted on scrims that appeared and disappeared under lighting. The final scene, set within the secret garden in full springtime blossom, is dizzyingly gorgeous, the landscape in golds and purples, a small lake in the distance. The costuming mirrored the sets: its palette of grays and browns alternating with the floating floral dresses that formed the mystery and memory of Mr. Craven’s dead wife. Together, sets and costuming harmonized, creating the calm ambience of a natural world. Claire Lewis, the 17-year-old dancer from Alameda who danced the contrary and transformative Mary, was long-legged and coltish, exhibiting real acting talent and charisma. She was matched with a wonderful dancer in Diego Rivera-Garcia as Dickon. Rivera-Garcia has a boyish exuberance and a loose-limbed quality that made him especially suited for the role despite his height, which made him taller than the dancers in the adult roles. Michael Lowe charmingly performed the aging gardener, dancing with his rake and hoe rather like Fred Astaire with a cane, or in one movie, famously, with a broom. He gets extra points for that fluid cartwheel over the wheelbarrow. Joralle Schmalle and Jenna McClintock danced several lovely pas de deux as the young Mr. Craven and his wife Lilias. The variation between the two, in which she is simply a memory, captured the sense of haunting and beautiful obsession that Guidi was striving for in his choreographic portrayal. Equally wonderful was the Oakland East Bay Symphony, which accompanied the dancers with the atmospheric and nostalgically beautiful music of Edward Elgar. Michael Morgan directed sensitively and with attention to the dancers. As beautifully conceived as this production is, the adaptation is not without flaws. With 31 scenes (more than the chapters in the original book), the libretto is difficult to follow. It’s hard to tell which character is who, and even harder to figure out the relations between characters and why they are as they are. This was echoed by the little girl sitting behind me, who kept asking her mother, “Who is that?” The attempt to follow the novel’s narrative overrides the dance genre to the point of inscrutability, and I often found myself wishing for less pantomime and more just pure dance. Besides serious editing and lengthening of the dance movements, a less literal, more abstract, portrayal of nature might have helped the piece’s metaphysic. Should the secret garden itself participate in the dance, rather than being relegated to backdrops and props? Still, this piece deserves development and preservation in the company’s repertoire. Just as the company deserves the same in the community. I was fortunate enough to go to the matinee performance, which was filled with children. Some of them spent the break dancing, whirling across the rug in the Paramount lobby, many of them in fluffy tutu-like creations of pink and turquoise. Some day they will need a stage, sets, lights, an audience.